The Silver Lake Trail is labeled as a 1.9-mile loop but I’ve found it to be much closer to 2.3 miles. Even at this distance the trail is too short for most off-road cyclists so its spared the heavy numbers of mountain bikes seen on the Crooked Lake Trail and especially the Potawatomi Trail. Arrive during the day in the middle of the week and it’s possible to have the path to yourself and not see anybody, biker or hiker. The Silver Lake Trail is worth putting up with an occasional trail rider for its exceptional scenery. This relatively short route includes views of three lakes, passes by a handful of ponds, and climbs several hills to make the walk invigorating as well as visually enjoyable. The trail can easily be hiked in tennis shoes. The loop starts at the Silver Lake day-use area, where there is a swimming area, picnic tables, bathhouse, and grills. The path is wide and well marked, and there's not a house within sight the entire route, something that most trails in the southern half of the state can't claim. Wildflower enthusiasts will enjoy this hike most if they arrive from late April through early May. To avoid user conflicts on the trail, mountain bikers follow the loop in a clockwise direction and hikers in a counter-clockwise direction by beginning at post No. 1 in the upper parking lot of the day-use area. You end up at the mountain biker’s trailhead is in the lower lot, and both have large display maps outlining all the trails in the park. 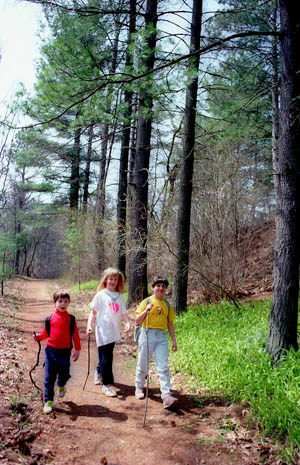 Silver Lake Trail follows the beginning of the Crooked Lake Trail in the same direction as the mountain bikers. The trail descends from the trailhead to skirt Silver Lake, weaving between low-lying wet areas and young stands of trees and then reaches post No. 2 in less than a quarter mile. Here you head west (left), cross Silver Hill Road and climb to the high point of the day at 970 feet. 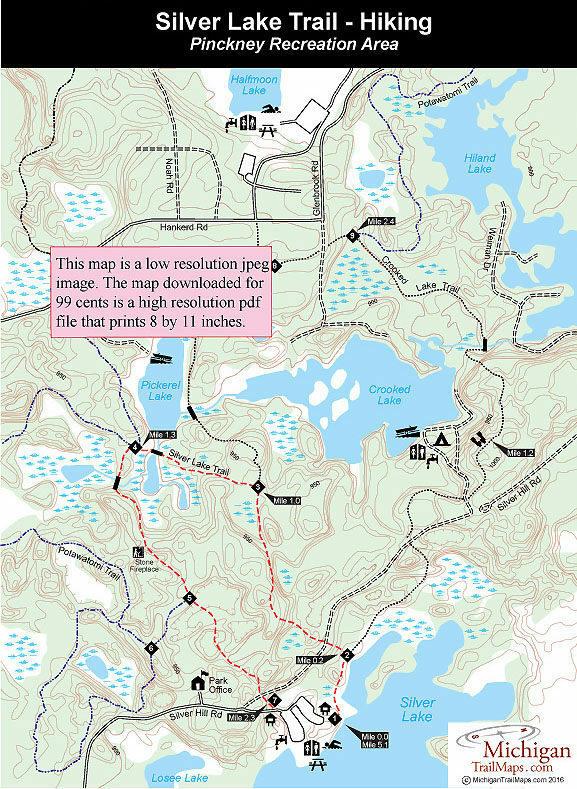 You descend the hill and continue dipping and climbing along a ridge where you first pass a kettle pond on the north side of the trail and then one on the south side. At Mile 1 you arrive at post No. 9 where Crooked Lake Trail splits off to the north (right). Silver Lake Trail heads south (left) and crosses a wetland area where there is a profusion of wildflowers every spring and, unfortunately, an equal number of mosquitoes in June. 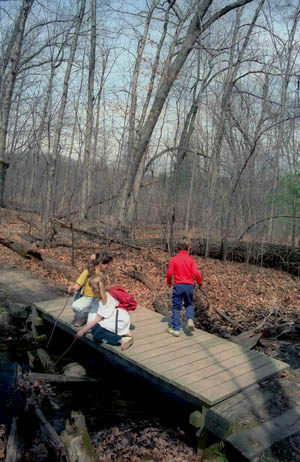 Within a third of a mile the trail arrives at a wooden bridge over a stream. This is a scenic spot. From the middle of the bridge you can view the length of Pickerel all the way to the fishing pier at its west end, or you can turn around to see what waterfowl is gathering on the small lake to the east. The trail climbs away from the bridge and at Mile 1.3 arrives at post No. 4, marking a junction with the Potawatomi Trail. Head south (left). You come to a view of two small lakes before the trail descends to a creek that flows between them and crossing it on a foot bridge. After climbing out on the other side, the trail skirts a ridge and comes to an old stone chimney and fireplace and what appears to be a fruit cellar, the foundation of a house that most likely was built in the 1800s by the Irish families who first settled here. You continue west, pass more views of a kettle pond and then arrive at post No. 5, marking the second junction with the Potawatomi Trail, roughly a half mile from the end. Just beyond it the trail reaches a lone pine at the top of hill, where you can view the short stretch of trail remaining. After descending from the one-pine hill you reach Silver Hill Road and then arrive at the trailhead for mountain bikers across the park entrance drive from the lower parking lot.